Disney Princes Form a Boyband in "Disney Dudez"
As a former Walt Disney World Cast Member, and boy band lover, when this video was sent to me it took no time at all to open and watch it. What followed can only be described as me having a total mental breakdown at seeing my favorite Disney Princes tackle their signature songs to the tune of other famous boy band melodies. All while dancing in sync under the coaching of Mickey Mouse. Haven't convinced you to watch it yet? The video doesn't feature just anyone playing the role of the Princes, (super cute) boy bandIM5 stepped up to the plate to fill the roles of our favorite animated characters ever. The video starts off with the Princes getting their heart broken as their Princesses break up with them, followed by Mickey Mouse the janitor telling them they now need to form a boy band. What follows is priceless. It is a perfect combination of boy band loveliness and Disney Prince hottness. Check it out below and let me know what you think! If any of you were able to catch Aaron Carter on his "After Party Tour" you very well may have had the lucky enough to see his opening act, Petrel. Petrel is an energetic pop-rock band made up of three sisters: Jessica, Rebekah and Destiny Petrel. Don't let their sweet looks fool you, these sisters rock. They have most recently opened up for Aaron Carter on his "After Party Tour" and they surely made an impression on the crowd, drawing in much of the audience with their infectious sound and attitude. Their most recent single was "Bombshell" and catchy anthem that detailed a cheating boyfriend looks at women coming together to stand up for each other. If you want to check out these sisters, be sure to follow them on twitter, and you can visit their official website. And be sure to check out the music video for "Bombshell" below. You can also pick it up on iTunes. Let me know what you think of these rocking sisters, and be sure to check out their most recent video, featuring the song "I Love It" by Icona Pop, showing clips from their time on tour with Aaron Carter. Heffron Drive, the band started by Big Time Rush's Kendall Schmidt and Dustin Belt, is hardly a new and unknown band to many Big Time Rush fans. The band was a project between Schmidt and Belt before Kendall started working on Big Time Rush, the band taking their name from a street that Schmidt and Belt grew up on. The band has had five songs featured on their Myspace page since 2009, released just before Kendall started working on Big Time Rush. The band has not been very active since Big Time Rush began, aside from a handful of tweets from Kendall and Dustin about the two of them writing. 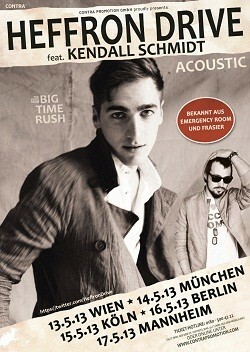 Heffron Drive managed to surprise fans when they announced a small tour around Germany earlier this year. The band will have five shows in Europe throughout May, and you can get your tickets here, and be sure to download their songs here for free! So if you are already a fan of Dustin Belt and Kendall Schmidt, let me know if you are looking forward to new projects and music from Heffron Drive, if you are just learning about Heffron Drive, let me know what you think about their sound! Miley and Liam are one of the "it" couples lately. After getting engaged last year they have been in the spotlight and frankly their love seems more sincere than many celebrity couple out there. Whether Miley is visiting Liam on set, or the two of them and skateboarding down the street together, I personally cannot get enough of these two. Justin Timberlake is currently taking the music industry by storm with his new single, Suit and Tie, and upcoming album, The 20/20 Experience. Jessica and Justin are definitely more mature than other celebrity couples, each of them coming out of more 'youthful' relationships. Who does not love seeing Jackie and Kelso together at last? Mila and Ashton have both gone on to bigger fame after leaving That 70's Show, and the two of them together seem like a perfect fit. It's almost like they were meant to fit together. Whether you like Twilight or not, Robert and Kristen are an intriguing couple to watch. Whether they are pouting on camera or off, when they pout together, they pout like the best of them. You don't need to watch The Kardashians to know Kourtney and Scott are the only competent people on it. Queen Kourtney and Lord Disick are the sarcastic, life hating couple that laughs with you as you laugh at their family, and together they are raising a new generation of Kardashians that might actually have something interesting about their personalities. It seems the Coachella music festival gets bigger and better every year. Now that it is January speculations are flying as to who will be traveling out to the desert to play the festival. With people wondering who will be playing, MTV News put together what they think the lineup should be, with some interesting choices included. 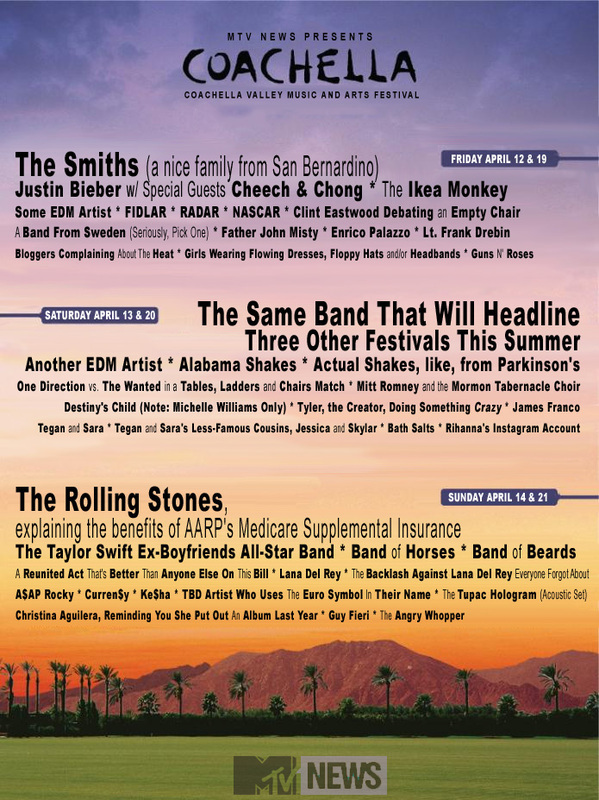 Pretty sure the actual lineup will look slightly different when it is released, but I must admit I would gladly camp out to see some of these acts, who wouldn't die to see Mitt Romney perform along side of the Ikea Monkey? Let me know who you are hoping will be included in the real lineup, and which bands from MTV's lineup you think would be hilarious to see. Let me introduce you to how I found out about One Step Away. Back in the days before Google+ even went public people were adding people just to have an active timeline. I was notified that a band page, for One Step Away, had added me, and after checking out their music, I quickly added them back. One Step Away is a pop punk band from Boston, MA, with a sound that is upbeat and members that are friendly and talented. One Step Away is a band that is sure to capture your attention and hopefully their music is sure to invade your MP3 player. Check out one of my favorite songs by them below and let me know what you think! And be sure to follow them on twitter! After catching my attention with their appearance on the E! show "Opening Act" and earning their place on my playlist with their youtube covers, TwentyForSeven released a new single this Monday with this lyric video. The tune is upbeat and is reminiscent of a hip disco song with a cool edge and a killer hook that will stick in your head and keep you dancing. Check out the video below and let me know what you think of the new song! For those of you that watch as much TLC and Discovery Channel as me, you've probably already seen and fallen in love with the show "Breaking Amish". Following the success of the TLC show, Discovery Channel has a show featuring a different look at the Amish premiering December 12. The show "Amish Mafia" will look at the unofficial law group that protects the religious community with their own kind of justice. What are your thoughts on this sudden interest in the Amish community? Do you think it's an interesting topic to look at or should some privacy be respected based on their secluded lifestyle? Hanson Cover "We Are Never Ever Getting Back Together"
As a huge Hanson fan, I couldn't help but get so excited when they released this cover of "We Are Never Ever Getting Back Together" by Taylor Swift. True to the Hanson style, they give the cover their own quirky spin to the song. Fans of their old song Mmmbop should definitely give this cover a chance to get to know the new sound the brothers have coined. 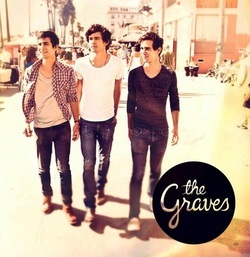 If you're a fan of retro feeling pop-rock, you'll dig The Graves. These three brothers from California are one of my latest obsessions. I found them through Big Time Rush, which actually is how I find a lot of great music, boy bands are always name dropping or are friends with talented artists you've never heard of, so remember that. While their name sounds more like a spooky Halloween loving band, their sound screams THE BEACH, a combination that works perfectly for the band. Some of their songs include "Still Young" (their newest single which made my Top 5 Songs of Summer list) "The Beach Song", "So Soon", and "Say It In A Song" (which played in Hollister for awhile and was written about the band's encounter with Taylor Swift). This band is mega talented and makes amazing music in their own retro-yet-modern way, check them out below and let me know if you're "digging The Graves"! Hey guys it's Nimo! Check out my page to hear about cool things you've never heard of, and really cool things you already love!